You should maintain throughout the day a constant conversation with Our Lord, a conversation fed even by the things that happen in your professional work. Go in spirit to the tabernacleâ€¦and offer to God the work that is in your hands. I think it is a fabulous idea and a good way to keep in the presence of Our Lord throughout the day. 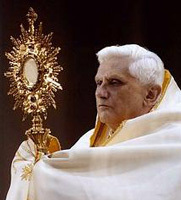 Another way I heard about in a talk on the Eucharist is to ask your guardian angel to go and kneel in the presence of Our Lord for you and tell Him you love Him.